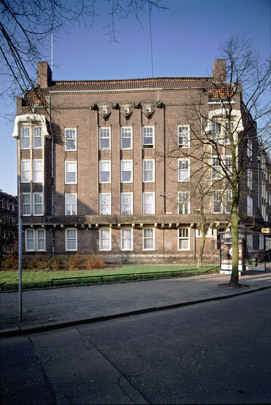 Fairly traditional-looking though it is, the Hillehuis is regarded as the first building to exhibit the Amsterdam School style. Outside, vertical touches predominate along with the decorative use of brick in the medallions above the windows. It was commissioned by the Amsterdam property developer Klaas Hille, who was also responsible for the housing in Spaarndammerbuurt. He originally approached Herman Baanders, a local architect, who passed on the commission to his fairly unbusinesslike protégé Michel de Klerk, whom he supported and had provided with a workplace at his office.